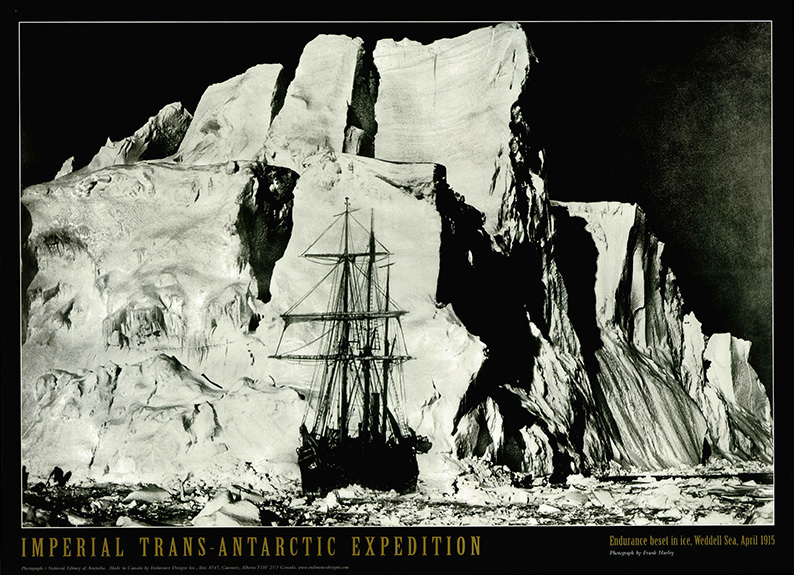 While beset, Shackleton’s ship “Endurance” drifted over 2000 miles (3200 km) in the pack ice of the Weddell Sea. On the way a huge mass of ice was encountered that they dubbed the “Rampart Berg.” Shackleton estimated the grounded iceberg to be 200 feet (60m) high, twice the height of the crow’s nest on the Endurance’s mast. The ship was at the mercy of the currents controlling the pack ice and was in grave danger of being crushed against the iceberg. As time passed, the Endurance drifted past the Rampart Berg and left it behind as the ship drifted west and north. This image is a composite Hurley made from two separate negatives.